Now that spring has arrived, everyone is excited about warmer weather and more daylight. After a long winter, we always look forward to welcoming a new season. Plus, Easter is right around the corner! Whether you are a first-time or annual host, there can be a lot of pressure to have the perfect gathering. These tips will help you host an ideal day for family and friends. One of the most important jobs of the host is to make guests feel welcome. When the doorbell rings, your guests should not be expected to let themselves inside. Everyone should be greeted at the door with an offer of a beverage. If you’re putting on the finishing touches when guests start to arrive, have appetizers out for everyone to help themselves to. On Easter, you can’t go wrong with pastels. Your dinner table should be adorned with the colors of spring, such as light pink, bright green and pale yellow. Cute accents like mini Easter eggs and porcelain bunny statues add charming style to your spring color palette. 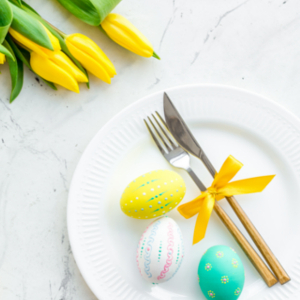 The classic main dishes on Easter Sunday are ham and lamb, but that doesn’t mean you can’t get creative with the rest of the meal! Deviled Eggs – use pastel dyed eggs and top with mini shrimp! What should you eat alongside the main course? Scalloped potatoes – cheesy starch tastes great with ham! Carrot cake – make your own cream cheese frosting! Bunny cake – decorate your favorite cake flavor with coconut topping, jelly bean eyes and a marshmallow nose with licorice whiskers! Are you hosting this major holiday? Relieve some of your stress and let Colony Diner do the cooking! We have everything from appetizers to dessert, including vegan and gluten-free options. View our menus today! « What Are The Benefits Of a Vegan Diet?